Given the sheer amount of peanut butter in my house, I think another peanut butter review is in order. This time I bring you a tale of 2 vastly different and unique peanut butters. The first is Krema, a company that produces under two different labels: Krema and Crazy Richard’s. 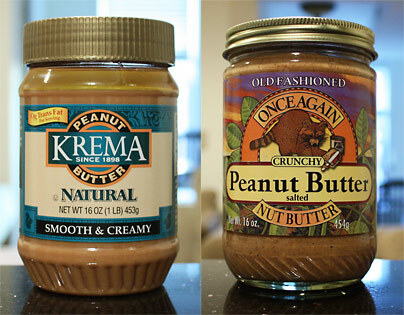 The two brands are identical products but marketed in different areas – it seems that people from the midwest prefer the term “Krema” while mid-atlantic inhabitants prefer to believe there is a mentally unstable man named Richard stomping peanuts into peanut butter. Once Again is a worker-owned company with a wide range of products that are very unique. Read on for all the gooey peanutty goodness! 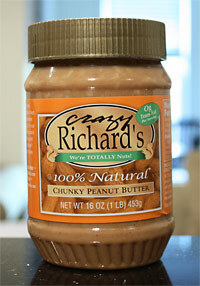 The only ingredient in Krema and Crazy Richard’s peanut butter is peanuts. The texture is ultra-smooth and creamy and will literally leave you speechless (this peanut butter is so sticky it will quiet even the yappiest chihuahua). The peanuts are so finely ground that this variety is closer to oil than traditional peanut butter, but that’s not a bad thing. Since it comes unsalted, I added about 1t kosher salt since I have a salty tooth. I found it a little tough to use for a peanut butter sandwich simply because you can’t apply enough peanut butter before it starts rolling off the bread, but the creamy consistency and pleasant medium-roast flavor make this a perfect baking ingredient. This is the perfect peanut butter for peanut butter banana pudding or as a topping for a colossal pancake. Krema’s crunchy offering doesn’t disappoint either. Using the creamy peanut butter from above, Krema (or Crazy Richard) has added some wonderfully pleasant peanut chunks to the mix. This variety is much more suitable for peanut butter sandwiches but won’t be any less tasty in your cereal. Again, I recommend stirring in 1t kosher salt for the perfect flavor. Aren’t their labels colorful? Most peanut butter is made by blanching peanuts, a process which removes the skin from the peanuts. It’s fairly uncommon to find a peanut butter made with unblanched peanuts, but Once Again is one of them. Leaving the skins on adds a different and unique flavor to the nut butter. The skins lend a slight bitterness to the peanut butter, but not in a bad way. It’s a nice change from other peanut butter and is great for cooking and baking. This would be great in Peanut Butter Sweet Potato Soup to add a nutty and earthy undertone to the soup. There is a small amount of salt added to this variety, just enough for most purposes, although I think I added just a pinch of kosher salt. Almost identical to the creamy version above, this version has chunks. Again, peanut skins are in this kind which offer a unique twist to your standard peanut butter. A pinch of salt helps complement the peanut butter and due to it’s supreme “natural” flavor, it’s great for making Peanut Sauce. The one thing about this variety is that it is quite sticky and difficult to eat by itself! It also makes spreading on bread a bit difficult. Interesting. Very interesting. Much like the old fashioned varieties, this organic offering is similar but with organic peanuts. Again, the skins are kept on the peanuts which is uncommon due to the slightly bitter taste it adds. The organic variety is much darker in color which likely comes from a darker roast. Also, it seems that there are more of the peanut skins left on this variety prior to grinding. Because of this, this peanut butter has a very rich peanut taste. As my father put it: “it tastes like liquid peanuts”. I couldn’t have said it better. I have never tasted a peanut butter that tastes so much like peanuts (with the skins on), almost overwhelmingly so. And because of my salty taste buds, the 1/2t salt I added made it just right. Again, this variety is much darker in color which points to a dark roast. With the addition of peanut chunks, this one is like eating liquid peanuts with peanuts in it. Very thick and sticky like the creamy version but even more so because of the chunks, this peanut butter is difficult to eat off the spoon and talk at the same time. Most peanut butter doesn’t give me trouble (perhaps I’ve become immune?) to peanut butter mouth but this one does it. Due to it’s unsalted nature, I would use this for cooking/baking or for a very robust PB&J. I think this would be great in a Chicken and Broccoli Stir Fry. I want to thank Nanette from Krema and Lisa from Once Again Nut Butter for providing me with samples of their fantastic peanut butter! And I’m not done yet, I still have a few more Krema and Once Again peanut butters to review! omg where did you find those?! I second Lauren’s comment – have you found them yet in stores? According to Justin’s they will be available at Whole Foods exclusively until January 2011 and then they should start showing up in stores where other Justin’s products are sold. Awesome – I’ll check it out, thanks! Great reviews, Nick. I’m thinking that both are those are worth trying! Yummm! They are indeed! If you can find them, definitely give them a try Nora! Out here in L.A./West Coast, they go by Krema. I’ve never tasted a better, more peanut-y brand. I believe they use Virginia peanuts. So delicious, and the chunky has HUGE, generously-portioned peanut bits. Good review, love the blog. Hi Evan, you’re correct! If you want to taste a peanuttier flavor, you should try my brand. I modeled it after my favorite natural brands, except we keep all the peanut skins on for a super peanut flavor. And the chunks in our crunchy are literally twice the size of the ones in Krema, if not larger!